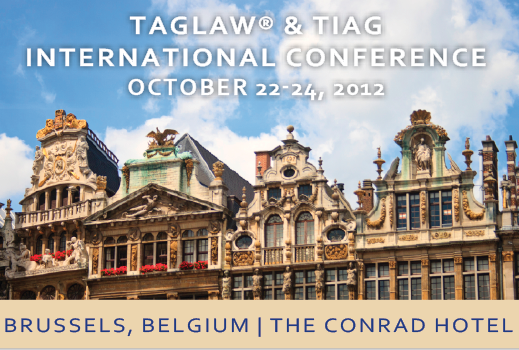 TAGLaw®, one of the world’s leading law firm alliances, conducted its 27th international conference on October 22nd to 24th at The Conrad Hotel in Brussels. Vincent Van Dessel, the CEO of NYSE Euronext Brussels, delivered a talk on the future of public markets as a vehicle of financing for small and mid-sized enterprises. The Art of Networking: Strategies for Engaging New Clients and Creating Relationships; Itzik Amiel, Founder and CEO, EG Group. TAGLaw also offered breakout sessions on firm management and opportunities for specialists in various aspects of the law to exchange ideas and experiences. Founded in 1998, TAGLaw is an international alliance of high-quality, independent law firms. Combined with TIAG, an alliance of independent accounting firms, they provide professional legal, financial and accounting services on a worldwide scale. With approximately 8,000 professionals in over 260 member firms, and more than 500 offices in over 90 countries, the two alliances serve tens of thousands of clients from all industry and commercial sectors. Learn more about TAGLaw at www.TAGLaw.com.